The post 7 Storm Preparedness Tips for Dog Owners by Marybeth Bittel appeared first on Dogster. Copying over entire articles infringes on copyright laws. You may not be aware of it, but all of these articles were assigned, contracted and paid for, so they aren’t considered public domain. However, we appreciate that you like the article and would love it if you continued sharing just the first paragraph of an article, then linking out to the rest of the piece on Dogster.com. 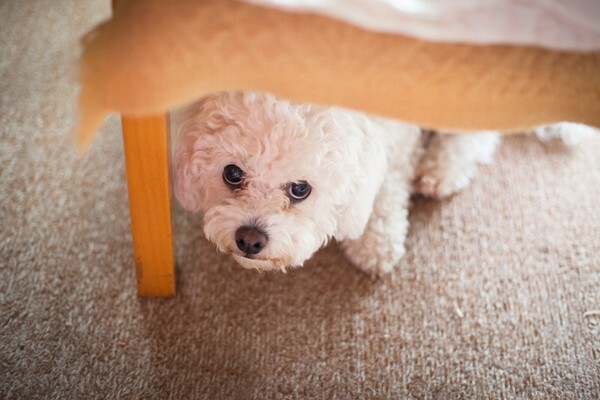 Ever tried coaxing a petrified pooch out from underneath the armoire? Then perhaps you can understand the importance of advanced storm preparedness. Don’t wait until every second counts. Planning for pet safety and comfort before there’s a problem can keep panic to more controlled levels when things become increasingly tumultuous. At the very least, it helps precondition our pets to understand what’s expected in specific, storm-fueled circumstances. 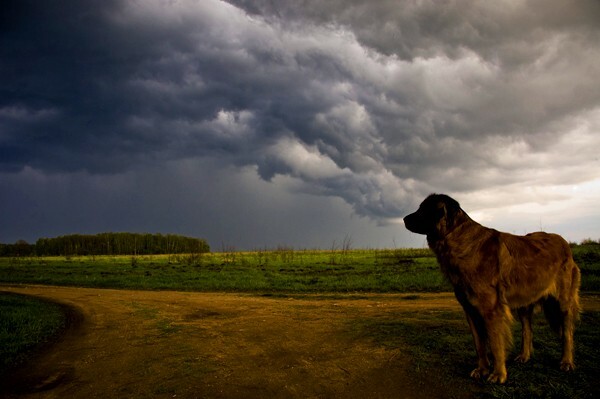 Consider the checklist of preparedness tips for dog owners below, so that you and your canine companions can weather a looming storm or unforeseen environmental upheaval as smoothly and safely as possible. Like humans, dogs can become unnerved by severe stormy weather. Unlike humans, they don’t always understand what’s happening or how to stay safe. Photography by Alzbeta / Shutterstock. In the event that you’re advised to remain indoors via a potential disaster warning, select your space well in advance. If you have a basement or storm cellar, that’s often the natural choice. If you don’t, choose an interior room on the first floor with a minimum of breakable windows. Make sure, above all, that there’s enough physical capacity for both your human and canine family members. Don’t sacrifice safety for comfort — a first-floor bathroom is, in many cases, safer than your family room — but simply consider whether everyone could fit in that space if you needed to spend more than a couple minutes hunkered down together. Let’s say the safest area in your home is a first-floor laundry room, and you have one child plus two dogs. Realize up front that the lack of space would likely necessitate your child and/or dogs sitting on mom’s or dad’s lap for an extended span of time. Then contemplate the complexities of herding a harried preschooler, a skittish Schnauzer and a testy Pekingese into a single confined location while the clock is ticking. See why practice drills are important? Take some time to sit in that chosen room with your canines. Use lots of treats and positive praise to make sure they come to associate the area with safety and reassurance. Also, realize that the smoke detector — as well as other various warning alarms — may go off in an emergency situation. Do these sounds panic your pup? Then start desensitizing now. Try using an audio recording that lets you control volume. Play it on low to simulate the alarm going off, then guide your nervous pooch to a predesignated room or exit. Secure him on-leash, if necessary. Bring along an ample supply of his all-time favorite treats and reward/praise him lavishly for following you — even if he appears unsettled. Practice this “alarm drill” behavior periodically, at different times of day, by progressively turning up the sound. Keep praising and rewarding until gradually, your dog looks to you for direction. Remember, public storm shelters don’t normally permit pets on leashes or even in carriers, unless those pets are designated service animals. So determine your plan now, while you have sufficient time to strategize. Check with regional hotels that accept pets and confirm their policies beforehand. If you’d likely stay with friends or relatives, make sure those people are able and willing to have your pets in their home. Also, remember to factor distance into the equation. If you’re experiencing a storm or natural disaster, nearby relatives and acquaintances will likely feel the impact as well. Taking advance precautions can reduce the chances that your pup becomes separated from you — or winds up out alone on the road — in the event of a storm. Photography by Alexandra Astaleks / Shutterstock. In an emergency situation, your pets depend on you as their advocate. So apply stickers to your front and back doors that alert first responders to canines in the house. Make sure neighbors know that you have one or more dogs, and ask for their help in the event you’re not home when an unexpected storm or natural disaster strikes. Having a grab-and-go pet disaster kit prepared in advance can save precious time. Select a roomy bag, then stock it with necessary medications, a supply of canned food, bottles of water, health records, copies of tags or vaccination certificates, a favorite toy, a towel or shirt with your scent, and a list of emergency contact numbers. Also include a calming aid like Bach Rescue Remedy, Ark Naturals Happy Traveler Chews or a soothing Thundershirt. Add some small paper plates, plastic spoons, a pill cutter, and a manual can opener. In the unthinkable event that you get separated from your beloved pup, enable easy identification. Check now — while you’re thinking about it — to make sure your pet’s microchip and tags are updated with all your current contact information. Also verify that your canine is up-to-date on necessary vaccinations. Once the storm has passed, be extremely cautious when you’re out walking your pup — look for downed wires, large unsecured objects, and the like. Whatever you do, never let your dog roam loose. Heavy rain and high winds can significantly alter familiar scents and landmarks. Your dog relies heavily on sense of smell and may easily become disoriented without your reassuring presence to guide him safely home. Thumbnail: Photography by Jaromir Chalabala / Shutterstock.